The crux of the helix is the edge of the outer curve. 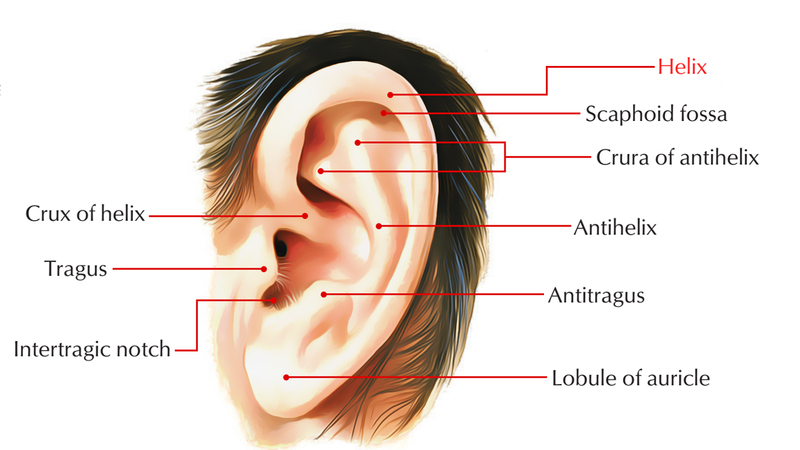 The fleshy lobule, called the earlobe, found while following the curve down towards the bottom of the ear. At the top of the ear is what looks like a true canal curving in from the helix. But the notch quickly terminates in a small bowl. Its scientific name for it is the helix canal. The antihelix is located at the lower part of the helix canal, which is lower compared to the crux of the helix. Ascending helix: spreads out vertically from the root. Superior helix: It starts at the top of the ascending part, expands horizontally and curves posteriorly towards the location of Darwin tubercle. Descending helix (a.k.a. posterior helix): Begins inferior towards Darwin tubercle and spreads out towards the superior border of the earlobe. The margin of the helix generally creates a rolled rim; however the helix is highly versatile in form. The lower section of the posterior part is frequently non-cartilaginous.